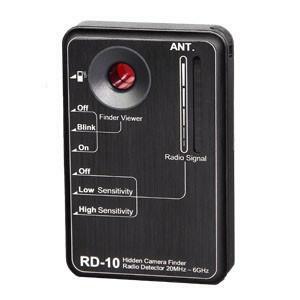 The RD-10 Bug and Hidden Camera Detector helps you locate hidden cameras and RF transmitters and also GPS on cars! RD-10 countermeasure camera finder , The RD-10 Bug and Hidden Camera Detector helps you locate hidden cameras and RF transmitters and also GPS on cars! Will Detect Transmitters In the 20 MHz to 60 Hz Range Detects Pinhole Cameras on or off. Telescopic Antenna Helps in Narrowing down Hard-To-Find Signals 3" x 1.75" X 0.5” Super Small Size Detect hidden cameras that use pinhole lenses with the RD10’s super bright and focused LED array. Simply choose steady or flashing mode while looking through the red viewfinder as you sweep the room. When you see a focused flash of light it could indicate the presence of a hidden camera. The RF detector senses signals in the 20 MHz to 6 GHz range. 347 Airport Pulling Rd N.